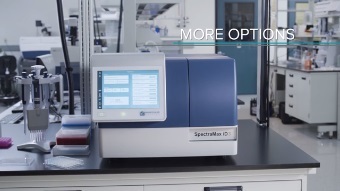 Molecular Devices’ just launched SpectraMax® iD3 Multi-Mode Microplate Reader is the cornerstone of complete laboratory solution helping to expand the boundaries of research. 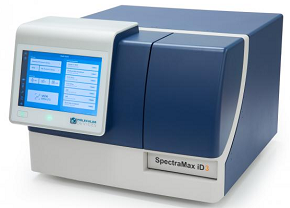 With optimized reagents and the industry-leading data acquisition and analysis tool SoftMax® Pro 7 Software, the SpectraMax iD3 allows customization of workflow to address challenging research applications. Built-in near-field communication (NFC) reader that enables one to pull up one’s custom protocols with a single step, saving precious time. A large, high-resolution touchscreen interface with an embedded software package allows the setting up of custom protocols and efficiently running them without the need for a dedicated PC workstation. SoftMax Pro® GxP software for regulated laboratories under GMP, 21 CFR Part 11 environments. The SpectraMax iD3 measures absorbance, fluorescence and luminescence. The superior optical system includes a xenon flash lamp and features an ultra-cooled photomultiplier tube (PMT) to -50C that reduces background noise for excellent sensitivity and a wide dynamic range. Featuring temperature control up to 650C, orbital shaking, wavelength selection in 1.0nm increments, a four-monochromator optical pathway with high efficiency gratings, well scanning up to a 20 x 20 read matrix, spectral scanning and detection of plate formats from 6- to 384-wells, robotic compatible, support for spectral scanning, end point scanning, kinetic scanning and well scanning all in the three modes namely absorbance, fluorescence and luminescence, the SpectraMax iD3 reader is the complete solution to the diverse research needs. The system is fully compatible with the SpectraDrop Micro-Volume Microplate, enabling quantitation of precious low volume samples. Performance matching 2ng/µL sensitivity has been easily achieved in SpectraMax iD3. A wide linear dynamic range ensures accurate assay results across a broad span of sample types.